As a general rule, there is very little warping of sound quality in floor standing speakers, even across the full range of sound that humans are capable of perceiving. This makes them one of the most ideal options for a home theater experience, particularly if you want your home cinema to include the latest in surround sound technology. Thanks to Bluetooth, you can buy wireless floor standing speakers that will integrate smoothly with the rest of your setup, allowing you to comfortably manage all of your settings at once. This requires a proper setup for your floor standing speakers/Tower speakers (regardless of whether or not they are wireless): you will need to position them to best take advantage of the acoustics in the area where your home theater is set up. As a rule of thumb, imagine a line being drawn directly out from the center of the face of each speaker. You want those lines to cross where your head will typically be while viewing—or, failing that, slightly behind it. This will need to be tailored to suit the environment, as well as personal preference. Achieving the ideal positioning will translate into a full, organic, and natural richness of sound, of the sort that you’ll be more accustomed to hearing at the movie theater instead of in your own home cinema. This is the essential reason why floor standing speakers are ideal for the home viewing experience. Unlike headphones, or systems comprised exclusively of smaller speakers, there is very little variation in authentic sound quality across the entire range of the human audible spectrum. 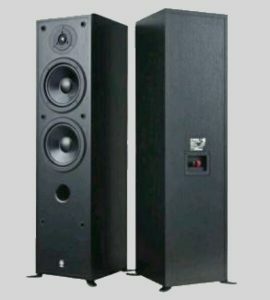 Large, floor standing speakers have multiple cones—often three or four: one, a tweeter, for high-frequency sounds, one for mid-range sounds (the woofer), and a subwoofer for low-frequency bass. 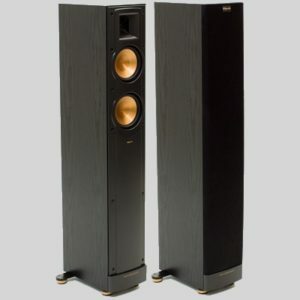 Large, high-quality floor standing speakers have a separate main speaker for mid-range frequencies, and the woofer handles the high end of low-frequency sounds. Each cone has its own driver; with two cones, there is a device called a crossover circuit, which tells the speaker when to start sending sound to the secondary cone. With three or more cones, a crossover network comprised of several circuits handles this job for all of the cones. Different cone materials are better suited to the production of different frequencies of sound. The more cones you have, properly networked and interlinked, the more accurately your speaker can reproducer a broader range of sounds as they were intended to be heard. By carefully modulating performance across the cones, making the transition of sound from one cone to another a gradual process, and giving the user the ability to change the crossover points for themselves (as with Bluetooth-compatible floor standing speakers), large speakers provide both high quality sound and an unprecedented level of control suited to personal taste. to focus on a particular range of sound, ensuring an experience that is tailored to your liking. Smaller speakers and headphones can’t provide this level of quality, or this amount of fine control. They are less subject to variations in sound based upon the quality of the individual item, but they can’t match the natural sound of larger speakers overall—and they show pronounced variation from flat sound at both low and high extremes. In the world of speakers and other audio equipment, the word “flat” is used to describe a favorable quality. This is often misunderstood by the inexperienced, who avoid products which are described as producing a flat sound. The word serves as a technical description: if you take a speaker’s ability to accurately reproduce a wide range of sound frequencies, and you chart it in a line graph, a flat chart is one with no variation from the desired sound quality at any frequency—thus, flat is desirable. The further from flat a speaker is, the more it distorts sound, usually either high-frequency sounds or low-frequency sounds. Even with headphones, it is normally possible to accommodate one or the other effectively. Because of the popularity of bass in modern music, coupled with the fact that our ears pick up discrepancies in low-frequency sounds more easily, means that many speakers are optimized specifically for low-frequency sounds. Low-frequency sound discrepancies, normally drop-offs (the loss of sound below a certain frequency), are one of the easier problems to correct with a high-quality speaker. As a result, floor standing speakers are also typically balanced toward the bass end of the human audible spectrum. Bear that in mind when balancing your new speakers to work in sync with the rest of your sound system. In your home cinema, to produce the best surround sound quality (and the most immersive experience possible), position two floor standing speakers adjacent to your screen—one on either side. It’s important, when setting up your home cinema, to be sure to leave enough space for your speakers to fit properly. Bear your size limitations in mind when shopping; floor standing speakers add a remarkable degree of accuracy to the reproduction of sounds regardless, but if you’re going through the trouble of researching and setting up your own home entertainment system, you want to shoot for the best quality possible. 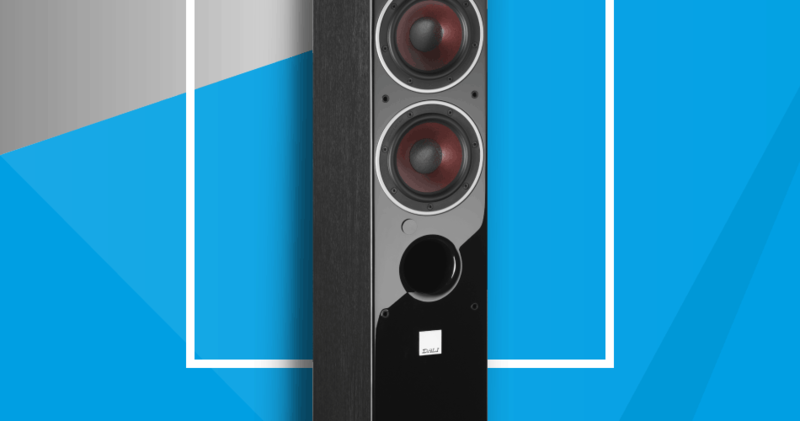 Floor standing speakers contribute greatly to the quality of the home cinema experience by reproducing theater-quality sound in your own living room—or bedroom, den, or wherever else you decide to set them up! 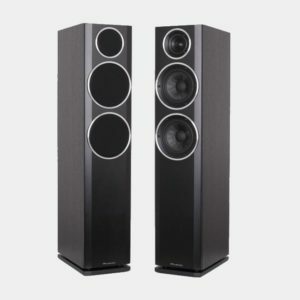 Can I Use Floor Standing Speakers for Surround Sound? previous post: Can I Use Floor Standing Speakers for Surround Sound?